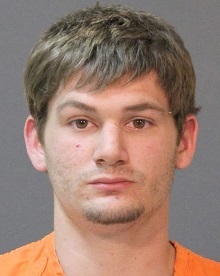 On January 25 Calcasieu Parish Sheriff’s Office deputies responded to a call at a local hospital in reference to a possible cruelty to a juvenile. Upon deputies’ arrival they were advised by hospital staff there was a 3 month old baby boy in the emergency room who had bruising throughout his entire head, eyes, ears, back, and inside his mouth, as well as, a laceration on his lip. Hospital staff also advised deputies the injuries to the baby varied in stages of healing. During the investigation detectives spoke with the baby’s father, Jordan M. Vidrine, 23, Sulphur, who admitted to striking the baby in the head but said he was aiming for a dog not the boy. Vidrine advised detectives he was unsure how the other injuries occurred. CPSO Deputy Sr. Cpl. Chris Miller is the arresting deputy on this case. CPSO Detectives Michelle Robinson and Jacob Dore are the lead investigators on this case.